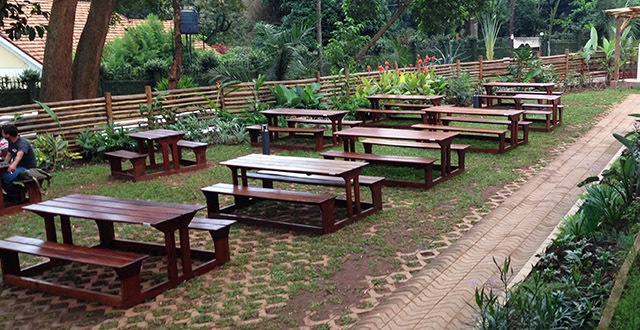 Kampala’s first beer garden has arrived! Yasigi Beer Garden is a brilliant concept for this city where the glorious weather allows for outdoor dining and drinking all year long. This new Kololo hotspot sits on a huge home plot with spacious outdoor and indoor seating. Allow me to sum up my review of Yasigi in one word: Inconsistent. In three different visits since they recently opened, I’ve had three very different experiences. One time the food was quite notably bad, while the next time it was delicious. One time my wheat beer was cold and crisp and the other time it was dull and bland. While that may sound like bad news, the good news is that I believe they are improving. Yasigi is an incredible concept and the owners are dedicated to figuring it out. On two of my visits, one of the owners actually came to our table to greet us and ask for feedback. That’s a good sign in my opinion! In true beer garden style, they’ve kept it casual with dark wooden picnic tables sprawling across the lawn and bar stools that wrap around a lovely bar with lit up trees. They’ve really created a nice ambiance here! They play good music with the volume soft enough that you can still carry on a conversation and the location is just perfect for large groups and parties. My only suggestion would be to add candles to the tables at night when it gets dark because it can be tough to read the menu. The servers are incredibly kind and welcoming but are still a bit slow on the actual service side. Also, I noticed that our server wasn’t very knowledgeable about the different beers, which is a vital element to working at any brewery. Hopefully, they’re still in the training process to become brew connoisseurs! 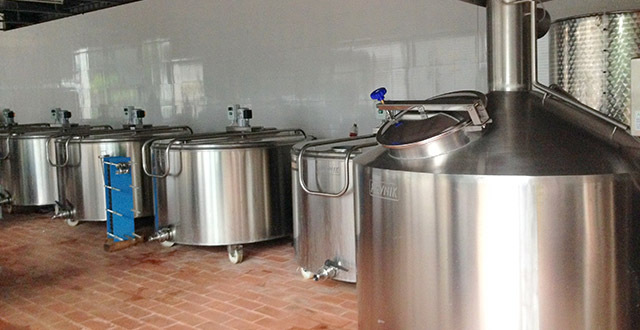 Yasigi specializes in four types of beer: Stout, Amber, Wheat, and Pilsner. All of the ingredients are imported from Germany and the beers are crafted on site. The brewing room is open for viewing so take a few minutes to walk through to give you a deeper appreciation of their beers. As I mentioned earlier, the brewmaster is still toying with the ingredients and recipes in an effort to perfect them, so just give it time. Pilsner: This beer has had the most dramatic change in the past few weeks. Upon my first taste, it had a color similar to the wheat beer and a decent taste with light flavor—in some ways comparable to a Tusker Lite. Then most recently, the color was more of an amber color and it had a slightly more complex flavor. The verdict is still out! Amber: The Amber is my favorite offering from Yasigi…a good amount of flavor but not at all overpowering. Stout: I’m really not a Stout gal—kudos to those of you who are—but this one is actually pretty good. It’s lighter than stout favorite, Guinness, and fairly smooth with a slight bite on the aftertaste. Wheat: The lightest of their beers and can be a bit bland, flat, and oily at times. Served with a slice of lime. Yasigi’s beers are very affordable at only 5,000 UGX for 300ml. and 7,000 UGX for 500ml. They also offer three-liter beer towers for only 35,000 UGX that are great for happy hours with your friends or sharing between larger groups! Though beer is their specialty, they also offer a full bar of other spirits, liqueurs, and house wine. What’s a nice craft beer without food to accompany it? Yasigi’s Kenyan chef cooks up a small selection of entrees such as nyama choma, fillets, fried chicken, and a variety of pork, beer, or chicken sliders. Entrees come with two side dishes of your choice and range from 17,000 – 25,000 UGX. I really enjoyed their beer battered fries, but leave the sweet potato fries alone as they tend to be quite dry. They also recently added brick oven pizzas to the menu because, as everyone knows, nothing compliments a cold beer better than pizza! I really enjoyed their pulled pork pizza with chopped green chilies and mozzarella. All pizzas cost 20,000 UGX regardless of their toppings, whether they’re vegetarian or with meat. I’m guessing these prices will change soon! 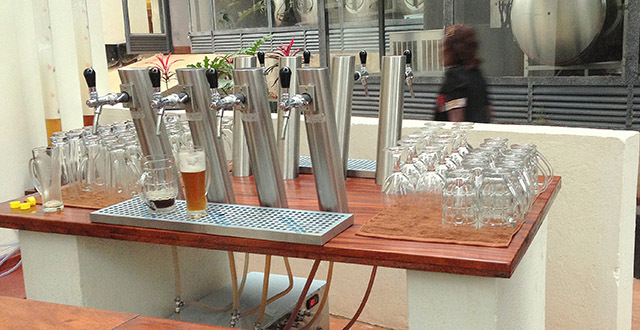 To wrap up, Yasigi Beer Garden has a ton of wonderful elements but still lacks in a few areas. The potential is really endless with how far they can take their business but, right now, it’s obvious they’re working through some ‘new business kinks.’ Be patient with Yasigi in the coming months and it’s bound to become one of your favorite spots in Kampala!